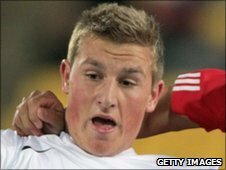 West Bromwich Albion striker Chris Wood has joined Brighton on loan until January after the termination of a similar spell at Barnsley. The 18-year-old, who played three games for New Zealand in this year's World Cup, left the Tykes by mutual consent on Friday. Seagulls manager Gus Poyet told the club website: "Chris is a player we have been aware for a long time. "He is an exciting prospect and player with huge potential." Wood, who turns 19 next month, failed to score in seven appearances at Oakwell. Since signing with West Brom in 2008, he has played 27 games netting three goals. Meanwhile, Poyet has also confirmed that he still intends to bring in a left-wing replacement for loan winger Kazenga LuaLua, who broke his ankle last week. He added: "Chris's arrival is unrelated to Kazenga's injury. We still need a replacement for him, and everyone is working hard on getting someone here as soon as possible."